We all desire point leadership in our own lives. This is common to everyone! We desperately want something or someone to rule over us, something or someone to follow, and some purpose to devote our lives to. Whether that turns into a person’s group of friends, a significant other, a career, a future dream to achieve, or just plain self-centeredness…everyone is desperate for a king. God has purposely designed us this way. In 1 Samuel 8, Israel has come to this point in their lives. They are sick and tired of the fake, phony, and perverted priest-judges that have been over them like the sons of Eli and the sons of Samuel. So Israel goes to Samuel their priest-judge and commands him to tell God to give them a KING to rule over them like all the other nations. I had always heard in Sunday school growing up that God didn’t want a king for them, that’s what they wanted. That’s not entirely true. Genesis 17:6 and Deuteronomy 17:14-15 are both promises by God to Abraham and His people that they will have kings one day. The problem isn’t that they wanted a king, but they wanted a king in their own way and in their own timing. We as Christians often end up sinning not because we want something that is evil, but we want something that is good in our own way and in our own timing. Israel told Samuel to give them a king like the rest of the world. Why did they want to look like the other pagan nations who were trying to destroy them and wipe them out? It seems like they wanted to be feared and respected by the rest of the world. We do the same thing as Christians. We often feel like the misfits and the freaks, the Michael Jacksons of the religious groups. But we shouldn’t want to be more like the world to be respected by the world. We should live in such an attractive way that the world would long to live like us in the excitement, abundant life, and loving relationships only Christ can bring. This is a constant sinful pattern in our lives…we want to reject God as our king, set up our own king, and to live our own way instead of God’s way. Who’s way are you living? Are you living out your own desires, or God’s way through His Word? 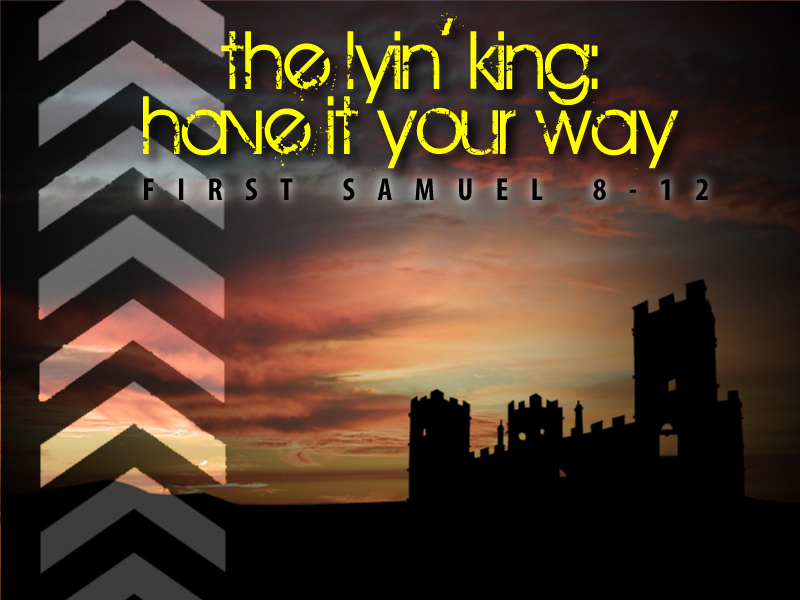 Samuel stood before the people and warned them of all the horrible things their king would do to them (1 Sam 8:10-18). He would enslave their children, he would confiscate their possessions, and he would do everything for his own selfish gain. Israel didn’t listen, but they again demanded a king to be like all the other nations and to fight their battles for them. They had gotten lazy. They no longer wanted to fight God’s way. They wanted to enjoy their sin, and still win in war. What they didn’t realize was, their battles were against sin, the evil system of the world, and Satan Himself. Israel have a king appointed by God probably wasn’t too far off down the road at all. But Israel demanding their own king in their own way was such a Satanic move on their part. Saul was chosen, he was accepted, and he became king all because they really liked the dude’s war-lord look. This true story has an overarching theme that shows us we really only have two choices. We can either serve Jesus as God’s king, or Satan as our own. You desperately desire a King. Are you serving God’s real King, Jesus Christ? He has fought our battle for us. He has gone toe to toe with the evil enemy, and His death for our sin has won forgiveness for our sin. His resurrection and raising back to life has been the victory that gives us new life in Him! Have you turned from your own sinful way and turned to God’s way by trusting in Jesus’s death and resurrection and making Him the Lord-King of your life? And if you have, are you living in such a way that reflects your salvation…by following and serving Jesus Christ as your King? Are you continuing to live life God’s way?